I’m not a religious man, but I often wonder if there is a devine curriculum director up there in the sky. He/she watches over us lowly bike mechanics and makes sure that we’re always working on a string of interesting new things in miniature streaks of repetition. I don’t know why, but in our repair shop one funky repair job will quickly be followed up with other repairs of the same type within days of one another. When we first opened up it was cracked solid rear axles on low-end mountain bikes that kept rolling through our doors. I must have done a dozen of them (or more) in the first two weeks we opened up. Then we got the “Old Roadster Flood of 2009” – guys pulling old roadsters out of the barn and bringing them in for us to tune up (mostly adjusting the out-of-tune rod brakes), swap parts, or simply gawk at. This month stated with a fascinating repair job. 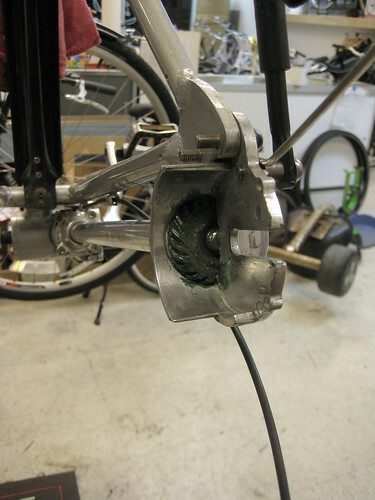 I had a chance to service a Shimano Nexus 8-speed hub on a shaft driven bicycle. A shaft-driven bicycle being worked on at Flying Pigeon LA. 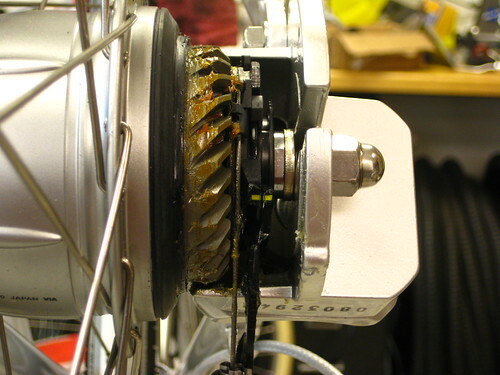 The owner complained of a 2nd gear snapping out of gear under pressure, and he was right – we could reproduce the problem, and it was isolated on that gear alone. He was a big guy and said he’d ridden the wheel at a slight angle in the rear drop-out for a while until it developed this shifting problem. After opening up the hub up completely (a newer roller clutch type Shimano SG-8R31 Nexus 8-Speed Hub), it turns out that one of the three pawls inside had a return spring that was shot (pawl was stuck in the “down” position) and a small piece had chipped off from somewhere inside the hub (Ouch! How did that happen?). 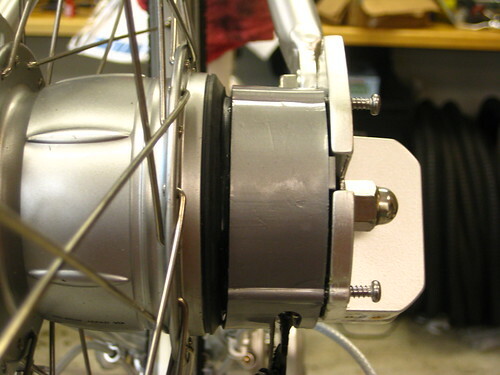 We ordered a new hub and swapped the new hub’s contents into the old shell (why rebuild a perfectly good wheel?). The one fiddly bit was removing the shaft drive “cog” (or is it an “acorn”) from the hub, and then re-installing it. It is kept in place on the hub with a really burly C-clip, which is hard to both put on and to take off. A once a year opporunity to dust up my skills and re-read all that documentation I’d downloaded months ago, cool! 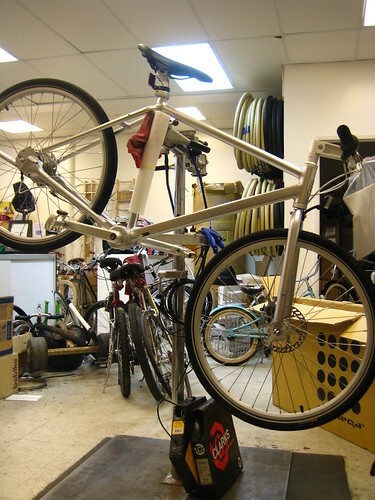 Biomega's Copenhagen bike - an 8-speed shaft driven bike in need of a thorough check-up after being quickly assembled at Flying Pigeon LA. Ack! Again with the shaft drive! No worries, this was an easy “line up the little yellow dots” job – just a little shifter cable tensioning and everything was ready to go. The secret is how you check the shift cable tension. Those two unscrewed screws need to come out in order to remove the protective panel and adjust the Shimano Nexus 8-Speed Hub. This cover protects the shaft drive from muck and grit, remove it to see the mechanism that changes gears on the Shimano 8-Speed Hub. Those two yellow marks should line up when the Shimano Nexus 8-Speed Hub is properly adjusted for shift cable tension. Once removed, this is how the little yellow dots should look when the Shimano Nexus 8-Speed Hub is in 4th gear. So the Biomega Copenhagen in Silver is now all done and is waiting for it’s owner-to-be (Danish skin-care guru Ole Henriksen, we’ve been told) to arrive back in Los Angeles. Thanks to that big educator up there in the sky for delivering these two shaft drive bicycles to our repair bay!